Wonderla Ticket Price on "Weekdays (Mon-Fri)"
Wonderla Ticket Price on "Peakday (Public Holidays) / Weekends (Sat-Sun)"
Wonderla Park Bangalore is undeniably one of the best amusement parks in the country. It also boasts of being one of the largest amusement parks in India. Attracting visitors of all age groups, it is an ideal place to spend a day of fun and entertainment. Around 28 km away from Bangalore, Wonderla Amusement Theme Park in Bangalore is located on Mysore Road. It was started in the year 2005 and since then Wonderla has been entertaining thousands of visitors every month. It is spread over a whopping area of 82 acres. Wonderla with its high standards of services, excellent maintenance of rides has received many awards from Indian Association of Amusement Parks and Industries (IAAPI), acknowledging its excellent features. Wonderla has been awarded for highest number of rides, highest number of innovative rides, best product manufactured most innovative rides and many more. A visit to this amusement world is enough to see the reason behind these awards. Wide variety of rides, ample of facilities and choices make a trip to Wonderla Amusement Park Bangalore pleasantly memorable. What makes the experience even better is the facility to book Wonderla tickets online. Wonderla Bangalore is synonymous to excitement and fun with its wide array of rides. There are umpteen numbers of Wonderla Rides, each offering an exciting experience. From high thrill rides for adventure seekers to various choices of activities for those looking for relaxation, there is something for everyone at Wonderla. Major kinds of rides that are offered at Wonderla are high thrill rides, water rides, dry rides and kid rides. Promising heavy doses of excitement, Wonderla Dry Rides create a heaven for adventure lovers. Comprising of state-of-the-art land rides and ample varieties ranging from laser show to thrilling ones like recoil, dry rides at Wonderla are indeed worth trying. RECOIL- India’s first reverse looping roller coaster, RECOIL is an experience that you will get only at Wonderla Bangalore. Imported from Netherlands, this high end roller coaster has two ramp tracks; it goes up to a height of 40 meters with a speed of 80 kmph in 1 second then moves through cobra roll and loop while ultimately moving to the second ramp and following the same pattern in backwards. XD MAX- In an air conditioned theatre with a capacity to accommodate around 180 seats XD MAX is a state-of-the-art ride which blends experience of watching a 3D film with physical movements and real environmental effects. Cinemagic 3D- Offering a glimpse of virtual reality cinema, Cinemagic 3D is a family thriller that presents an opportunity to have a memorable experience of watching HD-3D video, hydraulics-assisted seats moving in synchronization with visuals, multi-channel surround sound and blowers. 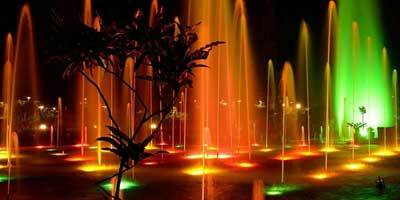 Musical Fountain and Laser Show-At Wonderla Bangalore watch the beauty of India’s only indoor musical fountain. This spectacular dance of water in sync with sounds and light is accompanied by an equally brilliant laser show. Hang Glider- It is an adventurous ride where you are suspended at a whopping height in a glider that moves through a computerized set of hydraulic movements. Pirate Ship- In the shape of a wooden craft, it is a massive swing that moves in an arc of 180 degrees, promising a thrilling experience to all. Net Walk- It is a walkway made up of mesh on all the three sides on which you have walk by marinating your balance and constantly moving forward. As it is quite safe, even young boys and girls can try this activity. Wonder Splash-In Wonder Splash, a bogie which looks like a raft that is built with logs takes you through a tunnel moving through a deep incline into a shallow pool; it moves at a thrilling speed with water spraying on you as the bogie moves through the pool. Techno Jump- Techno Jump is another exciting dry ride at Wonderla. It consists of 14 rods that surrounds a hub. All these 14 spokes have a capsule at the outer end; these capsules have a capacity to accommodate three people. These rods with capsules where one sits, make both vertical and horizontal movements with the entire machine spinning at the same time. Sky Wheel- With a diameter of 30 meters and a height of around 13 storey tower, this giant wheel moves slowly on a circular movement, offering visitors with a breath-taking aerial view of Wonderla and the surrounding area. Toon Tango- Toon tango comprises of four capsules with each capsule accommodating two people. These capsules then gently rotate, making it an ideal ride for visitors of all age group. Termite Coaster and Train- Two rides namely termite coaster and termite train move on a curvy path with steep climbs and drops inside a termite coaster mound. Dungeon Ride – A ride into the Dungeons of Horror also popularly known as Wonderla scary house, offer a scarily exciting experience. This dungeon ride, which is created on the story of a savage jail warden, takes you through a haunted prison. Inside the jail, ghost of the jail warden creates troubles which are accompanied by computer controlled movement of the ride. Crazy Cars- A perfect ride of everyone, from children to elders, crazy cars promises a bumpy and fun ride with a lot of pushing the other cars for space. There are two crazy car tracks to ride on. Crazy Wagon- At a height of 21 meters, crazy wagon offers a ride for entire family. Here the horse wagon moves in clockwise and anticlockwise direction in varying speed. Wonderla Bangalore has equal number of exciting water games. Offering a perfect setting for fun and enjoyment, Wonderla water games attract every visitor. Whether you are looking for an exciting activity or something to just relax and spend time, you can be sure to find a water game of your choice here at Wonderla. Rain disco to wave pools, to curvy water slides, there are umpteen numbers of options to choose from. Jungle Lagoon- It consists of 5 differently themed water slides and a huge water play area with a capacity to accommodate 400 people. Jungle lagoon is spread over 10,000 sq.ft. Its soft flooring, shallow water levels make it suitable for everyone. Lazy River- If not in a mood to do anything then go to lazy river tale a float and drift away. Enjoy your time as you move across the lion’s mouth, cross an alligator and a gargoyle skull or go under a fallen tree; all this at a relaxed pace. Boomerang- It is an exciting water ride which is apt of fun seekers. In this ride, you sit on a float that moves through a closed tunnel. The float eventually drops in a huge water slide from a height, moving into a constant to and from movement. Hara-kiri- This water slide takes you for an exciting ride, first downwards, then at a levelled path for some time and then again downwards. As you reach the bottom, you are again moved as high as you can go and eventually dropping you down. Fun Racers- Suitable for all age groups, in this water ride; you glide down on a rubber mat. You are required to lie on a prostrate position while you slid downwards as well on levelled path in between. Uphill Racers-Quite similar to fun racers in concept, in Uphill racers you are moved upwards and downwards creating a more stirring ride. Banded Kraits- In this water ride, you sit on a rubber raft and slid downwards through a curvy path and eventually moving into a shallow pool. These rubber rafts are of varying size, with a capacity to accommodate from one person to up to 4 people. Twisters-This water ride consists of four water slides, each in a tunnel shape. These slides move you through various bends and finally dropping in a shallow water pool. Water Pendulum-As the name suggests, here you are moved upwards and downwards like a pendulum in a massive U shaped slide. Wonderla Wave Pool- For those who want to just relax, Wonder wave pool offers an apt choice. There are two wave pools, one for elders with deeper level of water and another is shallow wave pool for children. The artificial waves and a lighthouse make the experience all the more real like. Water in wave pool is heated during winters, making it even better than real beaches. Wonderla Rain Disco-An indoor dancing floor which has been made more exciting with warm showers of water which are in sync with psychedelic laser lights and electrifying music. Rain disco, uses one of a kind technology i.e. intelligent rain system. Experience the thrill of dancing in rain with your favourite music playing in background at Wonderla rain disco. Play Pools- Play pools are suitable for all. Here water is sprayed on you from all direction as you play in the pool. Buckets of water are poured down as well. There are also small slides for children. Wavy and Vertical fall- Wavy and vertical fall is undeniably one of the most thrilling water rides, here you slid down from a height of six story building, finally ending in a water pool. You move with force as unlike Twisters, there are not levelled or circled path to reduce the speed. High thrill rides are the most exciting of all the rides in Wonderla. With their erratic turns and twists and high end technologies, these Wonderla rides promise a stirring experience to all. Most of the high thrill rides are not recommended for those with heart condition or high blood pressure. Visitors below 12 years of age are also not allowed to go for high thrill rides. Flash tower- On a tower of more than 40 metres high, riders are moved upwards with force but are suddenly halted in the middle before reaching the top, and then they are dropped down in a free fall which again stops in between and then falls down completely. Equinox- Here you are seated on a suspended seat; you sit facing outward with legs dangling in air. These seats are attached to a ring that is again suspended on a big rod which swings in a pendulum motion. At the same time, the rings on which the seats are attached also rotate. Here the riders experience multiple forces leaving you thrilled to the core. Insanity- As the name suggests this ride is not for those with weak hearts. It comprises of a four armed giant machine, each arm with four fingers like rod consisting of two capsules where the riders are seated. Each of the arm and the capsules moves independently in all the possible directions including turns, twists and rotations. This ride is not for visitors below 12 years of age or those suffering with heart ailments and high blood pressure. Hurricane- It is in the shape of a huge fan with capsules forming its blade. At a height of 20 meters, here riders sit in capsules; each capsule has a capacity to accommodate 8 people. These capsules rotate on their own axis as the fan turns. Riders below 12 years of age are not allowed for this ride. Y- Scream- At a height of 20 meters, a bow like structure stands with 16 capsules, each with a capacity to seat 2 people. As the bow twists and turns, the capsules also start rotating on their own axis. Maverick- It is a 21 seater capsule that is suspended to a vertical column at both the ends. These columns move in unpredictable ways, ranging from twisting, turnings, swinging to tilting. Mixer- As one can guess from the name, mixer presents an experience that one might feel if they sit in a blender. It spins and moves in all the directions leaving you screaming with excitement. Drop Zone-In drop zone, you are seated around a vertical tower with a height of 17 meters. You are then repeatedly moved up and down with high force, giving an experience similar to that of bungee jumping. These free falls are repeated many times. Wonderla Bamba- It has an 18 seater capsule that moves upwards and downwards in clockwise and anticlockwise directions, hastening suddenly and abruptly moving downwards in high speed. Wonderla Bangalore promises a fun filled time for children as well. Presenting a wide array of rides, it is a perfect place for children day out as well. The rides and slides for the kids have been especially made, taking their safety and comfort into consideration. Magic Mushroom- It is merry-go-round rides where the seats are in the shape of ants and honey bees, which rotates around a mushroom. Mini Venice- This ride with a capacity to accommodate 24 children moves through canals which are called as canal of Venice. Mini Pirate Ship-As the name suggests, this ride is a minute version of pirate ship. Here the kids are seated safely while the ship gently swings up and down. Merry Ghost- A carousel ride for kids under the age of 10 years, which mildly moves up and down while rotating around an ornamented shaft. Kiddies Wheel- A miniature version of giant wheel, this ride provides an experience of giant wheel to the kids, without being risky or frightening. Mini Express- It is a colourful ride that goes around a circuit, allowing kids to have utmost fun in comfort. Moon-Walker- it is a small slide with both the sides padded where kids can slid down safely. Jumping Frog-It is also a merry-go-round ride with seating cabins in the shape of frogs. These frog shaped cabins where kids are seated leaps into air, offering a unique experience. Flying Jumbo- In this ride, kids are seated on flying elephants which then moves in circle as well move in upwards and downward direction. Lion Swing- This is a slow ride, where kids are seated on a log that is shielded by a lion and a cub. It spins with constantly changing axis. Funky Monkey – Especially for the kids between the ages of 6 to 12 years, this ride is a mini version of drop zone. In this ride, kids experience a free fall from a height of 4 meters. Carousel- One of the most popular rides among kids; it is a merry-go-round where kids sit on colourful horses that move in circles. Illumination in evening, make this ride even more alluring. Convoy- Here kids are taken on a convoy of mini trucks. The convoy moves through a hilly terrain. Wonderla Amusement Park Bangalore has not only exciting rides and slides but an equally alluring accommodation facility as well. For those interested in spending a few days or a night at Wonderla, Wonderla Resort Bangalore offers an ideal option. Wonderla Resort, with the amusement park in its close proximity, is perfect to relax after a day full of activities. Tourists can enjoy a luxurious stay at the resort, pamper themselves with facilities like spa, swimming pool, etc., while spending their days at the amusement park trying various rides at leisure. From enjoying a sumptuous meal at its fine dining restaurant or enjoying a moment of relaxation at the swimming pool, one can indulge in a wide range of activities at Wonderla Bangalore Resort. For staying, there are three kinds of rooms that are offered; these are executive rooms, deluxe rooms and the suite rooms. Each room is spacious and equipped with high-end facilities and amenities. Some of the facilities that are offered at the Wonderla Resort are swimming pool, fully equipped gym, recreational rooms, kids’ activity room and four banquet halls. Along with all this, ‘Woods’, a fine dining restaurant, pampers you with mouth-watering delicacies while the bar ‘Red Ice’ offers a perfect ambiance to have a drink or two. If you are wondering how to ensure a room for yourself on your next trip to Wonderla Bangalore, then you book the rooms online. We at Holidays DNA make it easier for you to book accommodation at Wonderla Resort Bangalore as well as Wonderla park tickets online. Wonderla Timings are from 11 AM to 6 PM on weekdays. The timings for Wonderla on Saturday and Sunday are from 11 AM to 7 PM. Wonderla Ticket price differs for weekdays and weekends and public holidays. There are different rates for regular tickets and fasttrack tickets. Fastrack tickets are limited in number. Only 500 fastrack tickets are offered in a day. With fastrack tickets, visitors need not stand in long queues. Regular Wonderla Bangalore ticket price on weekdays is Rs.920 per person for adults and Rs.740 per person for kids while Fastrack ticket price on weekdays is Rs.1, 840 per adult and Rs.1, 480 per child. Regular Bangalore Wonderla ticket price on weekends and public holidays (also known as peak days) is Rs.1, 150 per adult and Rs.920 per child. Peak Day/Weekend Fast Track ticket price is Rs.2, 300 per adult and Rs.1, 840 per child. For child rates to be applicable, kids are required to be 90-140 cm in height. 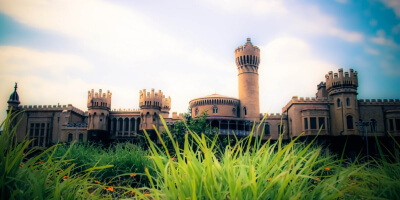 Is it possible to stay in Wonderla Bangalore? Yes Wonderla Amusement Park Bangalore also has a Wonderla Resort with different kinds of rooms for accommodation. Stay at Wonderla Resort can also be booked online. What is Wonderla timings on Weekdays? Wonderla timings of Weekdays are from 11 AM to 6 PM. What is Wonderla timings on Weekends? Wonderla timings on weekends are from 11 AM to 7 PM. Is wonderla closed during Public Holidays? No, Wonderla Bangalore is not closed on public holidays. Who is the Owner of Wonderla? Owner of Wonderla is Kochouseph Chittilappilly and his son Arun Chittilappilly. What is the area of Wonderla Bangalore? The total area of Wonderla Bangalore is 82 acres. Where is Wonderla in Bangalore? Wonderla Bangalore is located on the Bangalore Mysore road. What is Wonderla Bangalore address? Wonder Bangalore address is 28th km, Mysore Road, Before Bidadi, Bengaluru, KA- 562109. What is Wonderla Bangalore Working Days? Wonderla Bangalore is open on all days of the week. On weekdays it is open till 6 PM while on weekends it is open till 7 PM. What is the distance from Bangalore to Wonderla? The distance between Bangalore and Wonderla is around 28 km. Is there a Bus Service to Wonderla Bangalore? What is Entry fee for Wonderla Bangalore? Wonderla Bangalore entry fee differs from weekdays to weekends. For weekdays, regular ticket price is Rs.920 per adult and Rs.740 per child while fastrack ticket rates are Rs.1, 840 per adult and Rs.1, 480 per child. For weekends or public holidays, regular ticket price for Wonderla Bangalore is Rs.1, 150 per person for adults and Rs.920 per child. Weekends or Peak day price of Wonderla Fastrack tickets are Rs.2, 300 per adult and Rs.1, 840 per child. What is the Wonderla entry fee for Students? Wonderla Entry fee for students are offered at concessions. Students get a discount of 20% at wonderla ticket price. However, to avail the discount, students are required to be below 22 years of age and must have original College photo ID. For school PUC students, there is a discount of up to 35% on Wonderla entry fee. This discount is offered to a group of minimum 20 students who must be carrying an authorisation letter from the head of the institution. Are there any Hotels near Wonderla Bangalore? Wonderla Bangalore has Wonderla Resort for accommodation which is located just next to the amusement park. There are a few other hotels near Wonderla Bangalore, located on the Bangalore Mysore road. There are a few restaurants located near Wonderla Bangalore as well such as Thirumala Green Palace, Malgudi Vatika, etc. These are in addition to the food courts in Wonderla amusement park and the restaurants at the Wonder Resort Bangalore. Were there any accidents in Wonderla Bangalore? In the year 2012, there was an accident involving a school girl in Bangalore Wonderla Amusement Park. This was the only incident. What is the list of Wonderla Games? Wonderla Bangalore has ample of games ranging from water slides, dry rides, high thrill rides and kids rides along with a new ride named RECOIL. Kids rides -mini Venice, kiddies wheel, mini express, merry ghost, moon-walker, jumping frog, carousel, flying jumbo, lion swing, funky monkey, mini pirate ship, and convoy. Water Slides- Lazy River, Wave Pools, Boomerang, Fun Racers, Harakiri, Uphill Racers, Banded Kraits, Twisters, Rain Disco, Water Pendulum and Play Pools. Dry Rides- XD max, Musical Fountain and Laser Show, Cine Magic 3D, Hang Glider, Net Walk, Pirate Ship, Wonder Splash, Toon Tango, Sky Wheel, Dungeon Ride, Crazy Cars, Termite Coaster and Train, Crazy Wagon and Techno Jump. What about my valuables? Is there any Locker facility at Wonderla? Valuables can be kept at lockers which are available at the changing rooms in Wonderla Bangalore. Along with this there is cloak room as well in Wonderla where heavy luggage can be kept. Are swimming costumes available on Rent at Wonderla? What's the Cost? Yes, one can get swimming costumes in Wonderla Bangalore. They are available at the counter for sale. The approximate cost of swimming costumes for buying ranges from Rs.170 to rs.1000. Can I bring own food or drinks into the Wonder La Theme Park?/Can I bring food or drinks into the Wonderla water park? Outside food is not allowed inside the premises of Wonderla amusement Park Bangalore. Is infant food allowed at Wonderla? Yes, only Infant food is allowed at Wonderla. What kind of food is available in Wonderla Bangalore Park? Wonderla Bangalore Park has five different kinds of eateries with a wide array of food choices. These are Greens- a pure vegetarian restaurant; Waves- a multi cuisine restaurant; Chillies offering Indian and Chinese specialities; Park View Restaurant offering veg, non-veg, south Indian delicacies; Pizza Corner; Courtyard Restaurant- seasonal outsell, veg, non-veg and biryanis and Five Star Chicken. Is there any dress code for Wonderla? What’s the clothing requirement? Yes there is dress code for Wonderla Bangalore. Visitors are required to wear clothes made up of synthetic materials. One can wear t-shirt, shorts, swimwear, three fourth and Bermuda while saris, denims, formal pants, dupatta, shawls or scarfs, cargos, burkas or any kind of purdah, school uniforms or indecent dresses are not allowed. Is there any specific dress code for Women in Wonderla? For the safety and hygiene, women are not allowed to wear saris, burkas or other kinds of purdah, scarfs and shawls. Other than this, the dress code applies same to men and women. Can I bring my own swimwear into the Park? Yes one can bring his or her own swimwear to Wonderla Bangalore. Is there any parking facility at Wonderla Bangalore? Wonderla Bangalore has ample of parking space for visitors. Does Wonderla have changing facilities? There are separate changing rooms for men and women at Bangalore Wonderla Park. Are wheelchairs allowed in Wonderla Amusement Water Park? There are a few wheelchair and prams available at Wonderla which can be taken at a refundable payment. Visitors can also bring their own wheelchairs to Wonderla. Are Pets allowed in Wonderla Amusement Water Park? Pets are not allowed inside the premises of Wonderla. Also there is no facility to keep pets under care at the park. Is there any concession for senior citizens at Wonderla? Senior citizens above the 60 years of age are given 205 of discount at Wonderla Park. Is there any group discount at Wonderla? Various corporate and group offers are given at Wonderla Amusement Parks. Contact us for any offers / discounts on Group Bookings & Corporate Bookings (more than 25 Pax). Bangalore Wonderla is located on the Jadenahalli Road, Hejjala, Mysore Road. It is around 28 km away from Bangalore city. If you are wondering how to reach Wonderla from Majestic then you need to travel via Mysore road which will take around 1 hour of time. There is another way via NH48 to reach Wonderla Bangalore from Majestic which will take little more than 1 hour of time. The route via NH48 contains a few tolls. 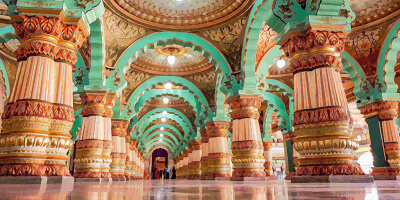 The distance between Mysore to Wonderla is 121 km, which can be covered within 2 and half hours of time.